An often-cited 2012 MetLife survey indicated that 1 in 3 principals was very likely to leave their role. 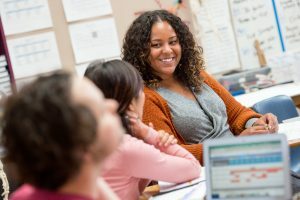 According to EdWeek coverage at the time: “Nearly half of principals surveyed indicated that they ‘feel under great stress several days a week.’ And job satisfaction among principals has decreased notably…” After the survey’s release, the education community echoed concerns about increasingly frustrated principals. But a new report indicates that while some principals may be as unsatisfied as they were in 2012, they are not in fact fleeing the job in droves. This past July, the National Center for Education Statistics (NCES) published findings on principal attrition and mobility from the 2016-17 Principal Follow-up Survey. The overall results show that principals stay in the profession at high rates. Among the 2015-16 cohort, 88 percent were still principals in 2016-17, with 82 percent of them in the same school. More than half had served as principals in the same school for three or more years, and nearly 70 percent had served as a principal in any school for three or more years. A higher proportion of charter school principals leave the profession compared to district school principals. The difference in the percent of leavers is less than four percentage points (13.8 percent compared to 9.4 percent), but the 2016-17 results are the first to show this difference. Results from the two previous versions showed differences less than one percentage point between the two groups. We can only speculate what factors may be driving the change, and only time will tell if it represents and emerging trend or a one-time blip. Having less experience as a principal does not appear to affect attrition rates, but experience as a teacher prior to becoming a principal may. The percentage of leavers across years of experience as a principal is fairly stable except for the highest levels of experience. Higher “leaver rates” among the most experienced principals is expected because of the impact of retirement. However, a slightly higher proportion of principals reporting less than five years experience as a teacher prior to becoming a principal left the profession, suggesting that either total experience, total experience in education, or specific experience as a teacher may influence how long a principal stays in the profession. A slightly higher proportion of principals who served in lower-income schools leave the profession compared to wealthier schools. The difference in the proportions between these two groups is only 3 percentage points (11 percent compared to 8 percent). It is also worth noting that the proportion of leavers serving in schools with a lower percentage of free and reduced-price lunch participation (between 25-49 percent) is about the same as that in schools with the highest participation rates. In short, student population doesn’t seem to largely affect principals’ decision-making. Even principals who indicate a high level of dissatisfaction in their work mostly stay in their roles. The vast majority of principals surveyed indicated that they find their jobs satisfying, and a sizable proportion indicate plans to remain in the profession as long as they are able or at least until retirement. Even among the subset expressing agreement with negative statements such as “I don’t seem to have as much enthusiasm now as I did when I began this job” (29 percent of respondents), “I think about staying home from school because I’m just too tired to go” (13 percent), or “The stress and disappointments involved in being a principal in this school aren’t really worth it” (16 percent), more than three-quarters of them stayed in their roles at their same schools. The good news is that on average, principals appear to be a fairly stable group: they stay in their roles over time, and when that stability is matched with quality leadership, good things will happen for students and schools. But it is critical to continue working to ensure that educators have the supports and resources they need to be successful so that every school has an inspired leader at the helm. This entry was posted in Research, School Leadership and tagged #BWTalksTalent, MetLife, NCES, principals on August 28, 2018 by Jennifer Schiess.